Hello all, can't tell if x10 booboo'd or....um I did. Meaning I took their sale wording for granted. Bought and received this for my Porch (possibly hidden in light) Cam project. Studying instruction(s) I thought all was good. How can I get this to work? Wasn't in the plans to use 2 power supplies. One of which I don't have. It's my understanding the Cam requires 12 volts for power. Wrong Sender they are packaging? I bought this way because I am considering hiding the cam in the large base of a Porch Light, running the wire in wall to a sender, and wirelessly send (who's at the front door) to existing receivers. Would use a Appliance Module to power up/down G.
Cryptic and with out enough information. If you got the $39 package, you should have two power supplies, one for the receiver and one for the transmitter which is also used to power the camera through the adapter cable. 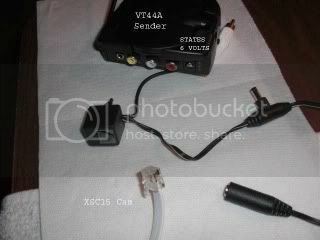 Plug one of the power supplies into the camera adapter cable and plug the video RCA plug into your TV or VCR...is the camera putting out video? If it is, then you have either a transmitter or receiver problem. The connection cable plug ends do not physically fit. I can't find exact specifications for the varied transmitters and receivers, but you could be correct. The power supply for the kit you received may not be the same as the one mentioned in the cameras manual. Does the power supply you received fit directly into the transmitter? If it does I would say the camera and sender are not meant for each other. Ah-Ha! No one 'splained it to me that way. Yup looks like a typical X10 screw-up. They constantly mix and match products to come up with marketing packages, with little regard to going in the back room to see if they can actually "stick this with that". ISO 9000 (even only 9004) would turn this company on it's ear. Yes, correct. And to your knowledge the cam does require 12v to operate? The VT44A Transmitter states 6v at it's power supply input. Hate it when plan doesn't start off well! The Shack shows a 12v 500ma Power Supply. Would have to go check it for the correct plug. I hate this saying.........'My Bad' good coffee this morning while typing G.
Obviously clearing off some back shelves... Amazing they didn't catch that! Goodmorning, Dinner and the Basketball Game stopped my investigation last night. aka X10 junk drawer has been fruitfull. Found a 9v (as stated in SC15A Camera Instructions) Power Supply and a 12v supply (as stated on the XSC15 Camera Instructions that came in the box. This is labeled 'PRO'. Using the Sender/Transmitter supply plugged directly to it, and the J drawer 9v supply plugged into cam adaptor cable, test drive reveals everything is working! 2 questions....should I let it ride at 9 volts sints it's working?....or should I not be scared and go with the 12 volt'er as stated on the enclosed instructions? Guess I'll have to run 2 power supplies in this case. Is it not a good idea to 'double up' on an Appliance Module output? To date I've just never done it on a' count of because. Would stand to reason though if one dosen't exceed the rating doing so should be just fine? G.
Nah you can plug a dozen gizmos into the Appliance Module as long as you don't exceed current ratings. I think Brian H or someone disected a camera and found the internal circuitry in the camera run on an internally regulated 5V, so it should work fine on the 9V power supply. Exernally the camera was designed to use 12V so it could take power from a Ninja base, which uses 12V. Lower than desired voltage will effect picture quality but should not cause camera damage. Wondering if they did as I haven't seen that offer again as of late in the numerous sales adds we get.